The PageRank algorithm is used by search engines to rank websites in their search results. The algorithm outputs a probability distribution that a person randomly clicking on links will arrive at any particular page. Intuitively, a node in the center of the network should be visited with high probability even if it has few edges, and an isolated node that has many (local) neighbours will be visited with low probability. The idea of PageRank is to rank nodes according to a stable state and not according to the previous local measurement of inner/outer edges from a node that may be manipulated more easily than the corresponding entry in the stable state. In this paper we present a deterministic and completely parallelizable algorithm for computing an \(\varepsilon \)-approximation to the PageRank of a graph of n nodes. Typical inputs consist of millions of pages, but the average number of links per page is less than ten. Our algorithm takes advantage of this sparsity, assuming the out-degree of each node at most s, and terminates in \(O(n s / \varepsilon ^2)\) time. Beyond the input graph, which may be stored in read-only storage, our algorithm uses only O(n) memory. This is the first algorithm whose complexity takes advantage of sparsity. Real data exhibits an average out-degree of 7 while n is in the millions, so the advantage is immense. Moreover, our algorithm is simple and robust to floating point precision issues. Our sparse solution (core-set) is based on reducing the PageRank problem to an \(\ell _2\) approximation of the Carathéodory problem, which independently has many applications such as in machine learning and game theory. We hope that our approach will be useful for many other applications for learning sparse data and graphs. Algorithm, analysis, and open code with experimental results are provided. Lang, Baykal, and Rus thank NSF 1723943, NSF 1526815, and The Boeing Company. This research was supported by Grant No. 2014627 from the United States-Israel Binational Science Foundation (BSF) and by Grant No. 1526815 from the United States National Science Foundation (NSF). Dan Feldman is grateful for the support of the Simons Foundation for part of this work that was done while he was visiting the Simons Institute for the Theory of Computing. 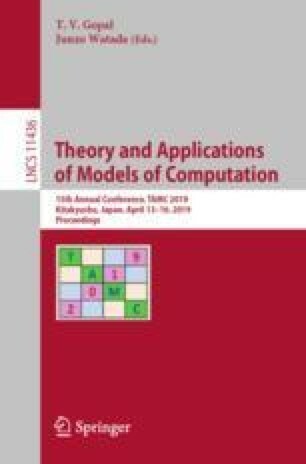 H. Lang and C. Baykal—contributed equally to this work.